When he made his international debut against New Zealand in the 2007 World Cup John Barclay became earmarked as a player of immense potential and a man with a long career in the Scotland No.7 shirt ahead of him. It was a day before his 21st birthday but he already looked at home on the international stage. It should not have been a surprise; Barclay had been selected in an extended Scotland just after his 18th birthday. That was even before he had made his Glasgow debut, two days too late to become the youngest ever player to take the field in the Magners League. 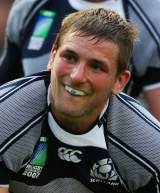 Barclay had two seasons as an apprentice before he signed a full contract with Glasgow. The second of these seasons was in 2005-06, in which his 17 appearances included all six of the Warriors' Heineken Cup pool matches. In 2006-07 he started 25 of his 27 appearances before being the only uncapped player to be selected in the World Cup squad. Prior to his full cap Barclay had made steady progression through the international ranks, the final step of which followed the 2007 Churchill Cup. At under-18 level Barclay had made a big impact in the 2004 Home Unions tournament and captained the Under-19 team in their opening match of the 2005 IRB World Championships in Durban. His Under-21 debut came in February 2006 against France in Falkirk and he played in all five matches in that year's U21 World Championships. As a schoolboy Barclay helped Dollar Academy to an impressive 27-14 win against Dundee High School in the Bell Lawrie White Scottish Schools Cup final at Murrayfield in 2004, and he has been awarded several accolades including the Macphail Rugby Scholarship and the Daily Record Sporting Heroes of the Future. It was in tandem with his Glasgow team-mates Kelly Brown and Johnnie Beattie that Barclay came to international prominence. Under the guidance of coach Andy Robinson the 'Killer Bs' were given an extended run in the side during the 2010 Six Nations, drawing many plaudits after helping to upset Ireland at Croke Park. Barclay continued to be first-choice openside for the national team through the 2011 Six Nations and was included in Andy Robinson's long-list World Cup squad.